Las Vegas (/lɑːs ˈveɪɡəs/) is the most populous city in the U.S. state of Nevada and the county seat of Clark County. Las Vegas is an internationally renowned major resort city known primarily for gambling, shopping, and fine dining and is the leading financial and cultural center for Southern Nevada. The city bills itself as The Entertainment Capital of the World, and is famous for its consolidated casino–hotels and associated entertainment. A growing retirement and family city, Las Vegas is the 31st-most populous city in the United States, with a population at the 2010 census of 583,756. The 2010 population of the Las Vegas metropolitan area was 1,951,269. Today, Las Vegas is one of the top tourist destinations in the world. To give an idea why this is true, see 100 Best Things to Do in Las Vegas. Established in 1905, Las Vegas was incorporated as a city in 1911. At the close of the 20th century, Las Vegas was the most populous American city founded in that century (a distinction held by Chicago in the 19th century). There are numerous outdoor lighting displays on Fremont Street, as well as elsewhere in the city. Las Vegas often refers to the city plus some areas beyond the city limits, especially the resort areas on and near the Las Vegas Strip, and sometimes the entire Las Vegas Valley. The 4.2 mi (6.8 km) stretch of South Las Vegas Boulevard known as the Strip is mainly in the unincorporated communities of Paradise, Winchester, and Enterprise. 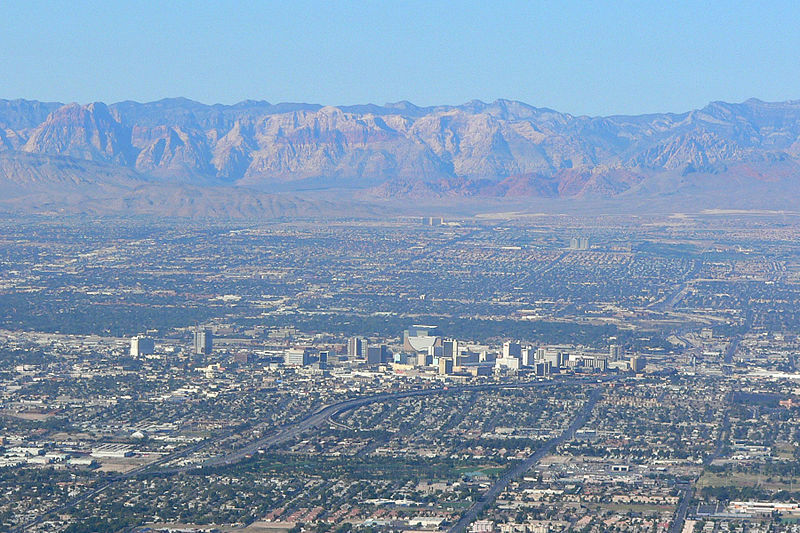 Las Vegas' climate is a subtropical desert climate (Köppen climate classification BWh), typical of the Mojave Desert in which it lies. The city enjoys abundant sunshine year-round: it has an average of about 300 sunny days per year with more than 3,800 hours of sunshine. The summer months of June through September are very hot and mostly dry, with a July daily average temperature of 92.5 °F (33.6 °C), while night-time temperatures often remain above 80 °F (27 °C). There are an average of 131 days of 90 °F (32 °C)+ highs, and 70 days of 100 °F (38 °C)+ highs, with most of the days in July and August exceeding the latter benchmark, and only occasionally failing to reach the former. Humidity is very low, often under 10%. Las Vegas' winters are of short duration and the season is generally mild, with December, the coolest month, averaging 47.7 °F (8.7 °C). The mountains surrounding Las Vegas accumulate snow during the winter but snow is rare in the Las Vegas Valley itself. Although, on December 16, 2008, Las Vegas received 3.6 inches (9.1 cm). Temperatures reach the freezing mark on 7.5 nights of the year but rarely sink to 20 °F (−7 °C). Annual precipitation in Las Vegas is about 4.2 in (110 mm), which on average occurs on 26–27 days per year. Most of the precipitation falls in the winter, but the wettest month (February) has on average only 4 days of precipitation.